2006’s Sharp Objects announced Gillian Flynn as a major talent on the literary thriller scene. It was no surprise that she built on the success of that critically acclaimed and best-selling debut with Gone Girl and Dark Places, both turned into feature films already. But it was her first book that HBO deemed worthy of its lavish mini-series treatment à la The Night Of and Big Little Lies. Starring Amy Adams, Patricia Clarkson, Chris Messina, and Eliza Scanlen, and directed by Jean-Marc Vallée, the HBO series has received acclaim, hooking viewers with its dark vision of a reporter returning home to write a story about the murder of two girls. When the project was announced, the question most readers of the source material had was a simple one: How on earth do you turn a relatively short book (around 250 pages) into an eight-episode miniseries? The simple answer is that you broaden its perspective and expand its universe, although showrunner Marti Noxon’s adaptation deftly keeps the core of Flynn’s vision intact, building around it without ever losing the center. Luckily, most of the differences feel like they enhance Flynn’s themes instead of just padding out the plot to get to eight episodes. The basic plot of book and series are the same—a reporter named Camille Preaker (Amy Adams) comes back home to Wind Gap, Missouri to write a story about a missing girl and how she may be connected to a previous murder. The trip intensifies her alcoholism and brings back memories of how often she cut herself over the years, leaving the scars of words on her body. Her mother, town legend Adora Crellin (Patricia Clarkson), haunts the family home like a Daphne du Maurier character. Camille’s half-sister, Amma (Eliza Scanlen), serves as a symbol of the teen girls caught between emotionally abusive mothers and a dangerous world. As Camille works to “get the story,” she also faces the demons of her past, including the death of her sister, Marian, at a young age. Most of the plot twists (so far) are the same in book and series, but perhaps the biggest difference between the two is one of perspective. The book is written in first-person, forcing us into Camille’s troubled mind, and only allowing us to see what she sees and know what she knows. Camille is definitely the protagonist of the series as well, and the mystery is often unfolding for her at the same time it does for viewers. But it also leaves Camille’s side, such as in the scenes in which Detective Richard Willis (Chris Messina) investigates the murders on his own. It arguably breaks some of the tension of the book, turning the series into more of a portrait of a case and small town than the directness of Camille Preaker’s confrontation with her family and her past. By allowing viewers to spend time alone with the cop referred to derogatorily as “Kansas City,” Noxon and company also significantly deepen the role of that character. In Flynn’s book, he is primarily a sounding board for Camille at this point in the story. They connect by both being out-of-towners investigating the case from different angles as reporter and officer, but the show greatly expands on his role, making him more of a protagonist himself. There was certainly no scene of Richard pulling the teeth out of a pig in the book. In fact, the Richard of the series feels way more intensely involved in the case than he did on the page, probably to better use Messina’s talents by giving him a richer character. Richard’s background—he’s a Kansas City cop, making him something of a city mouse in a country town—is the same, but Camille’s has been tweaked slightly. In the series, she comes down from St. Louis, a town not far from Wind Gap in the grand scheme of things. In the book, Camille ran a bit further away from home, escaping all the way to Chicago, where she worked for the fictional Daily Post, billed as the fourth-largest paper in the Windy City. There’s a sense in the book that Preaker and her editor, Frank Curry (played by Miguel Sandoval), really need a big story to break out among the city’s crowded media. The series makes it feel more like Curry sent someone he cares about home to face her demons, and the juicy assignment is secondary. Casting can often enhance a difference between a series and its source, and choosing Sandoval for the role of Curry certainly does that here. Curry’s ethnicity isn’t made clear in the book, but Sandoval is a Latinx actor and the performer who plays his wife, Eileen, is black. Wind Gap is remarkably white. There’s a contrast between the people in Camille’s chosen home of St. Louis, who obviously care about her, and the ethnically flat background from which she emerged. That feels intentional in the show’s casting and adds context that isn’t really in the book. Richard and the Currys aren’t the only characters who gained layers from page to screen. Camille’s step-father, Alan Crellin (played by Henry Czerny in the series), is more like a phantom than an actual human being in Flynn’s novel. He’s sketched in by the author as the kind of hollow-eyed gentleman who barely registers, especially next to the force of nature that is Adora. He is described by Flynn as “…thinner than my mother, with cheekbones that jutted out of his face so high and sharp his eyes turned to almond slivers. I wanted to administer an IV when I saw him.” In the book, he is still a shadow of a man, but he has more depth and personality in the HBO version, even being allowed a moment alone for a silent scream. Most of the supporting cast has this trait in common, including Police Chief Vickery (Matt Craven), a similarly gruff character in the book but made more complex in the show. The central trio—Camille, Adora, Amma—is essentially identical from book to show, while everyone around them has expanded from two-dimensional in Flynn’s debut to three-dimensional on TV. Even characters from Camille’s past have been enriched. In the book, there are mentions of rehab and Camille’s issues with cutting—Flynn regularly refers to words on Camille’s body—but we don’t actually get the flashbacks as we did in episode three, the most extensive diversion from book to series so far. The character of Alice, Camille’s roommate who committed suicide, is a TV creation entirely, but it’s one that fits perfectly within the thematic vision of the source. 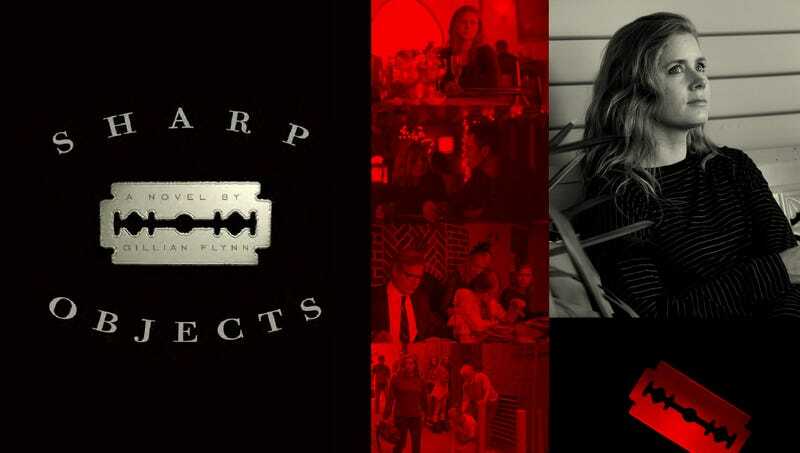 At its center, Sharp Objects is about lost girls—the murdered ones, Amma, Marian, and even Camille—and Alice is another one of those girls ignored and mishandled until it was too late. Those flashbacks in the show don’t feel like they are merely filler to get a short book to a mini-series running time, but plot development that fits the themes of the source material. The extended flashback to Alice is particularly interesting because Flynn more regularly returns to Camille’s past than the first four episodes of the series has. We have seen glimpses of a young Camille and her sister on the show, but Marian is more of a constant presence in the book, haunting Camille every time she’s in her mother’s house. We also learn more about young Camille’s sexual awakening, although both of these elements—Camille’s teen years and her sister’s death—could have merely been moved to the back half of the season and not excised entirely. As with most adaptations, there are details here and there that have been tweaked. For example, Camille wasn’t surrounded by so many people when she found Natalie’s body, a lot of the neighborhood kids have been aged a bit, and Natalie’s funeral plays out differently. However, a surprising number of the scenes in the series have been pulled directly from the source. Overall, the differences are often more additional than altered. Only time will tell if that continues over the back half of the season or if Noxon and Vallée decide to pull the rug out from fans of the book and change the ending altogether. Start with: The book is such a quick read that it’s tempting to say you should start there, given that you could probably get through it in a few hours—certainly less time than it would take to watch the series. But the fact is that the book reflects some of the writing deficiencies of a debut author, whereas those issues with dialogue and character have been refined by the people behind the series. The show gives you most of what you would get from the book, and you get to see two of the best TV performances of the year from Adams and Clarkson. You won’t be missing much if you just start there.